Steven, another student we had planned to meet and who also studied at San Diego State, lives in Macau, China. 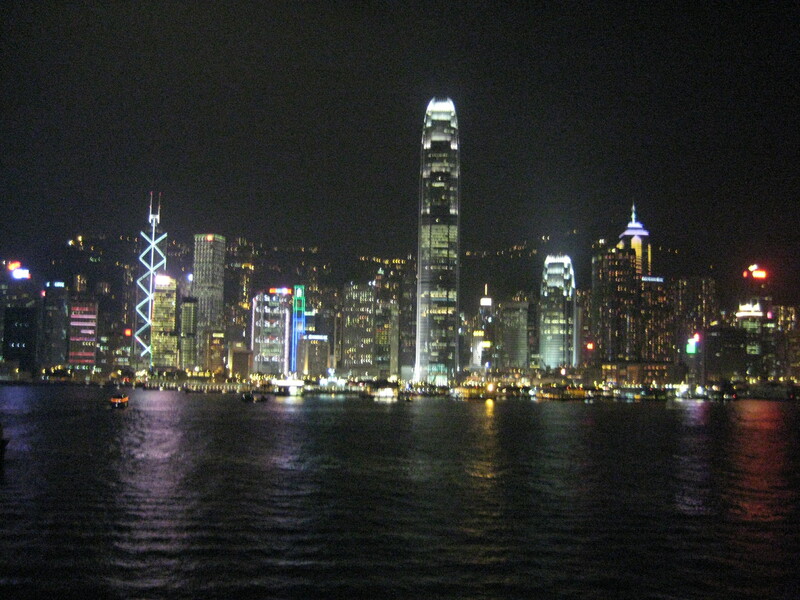 We headed out on the fast ferry from Hong Kong to Macau. The ferry was very modern and only took about one hour. 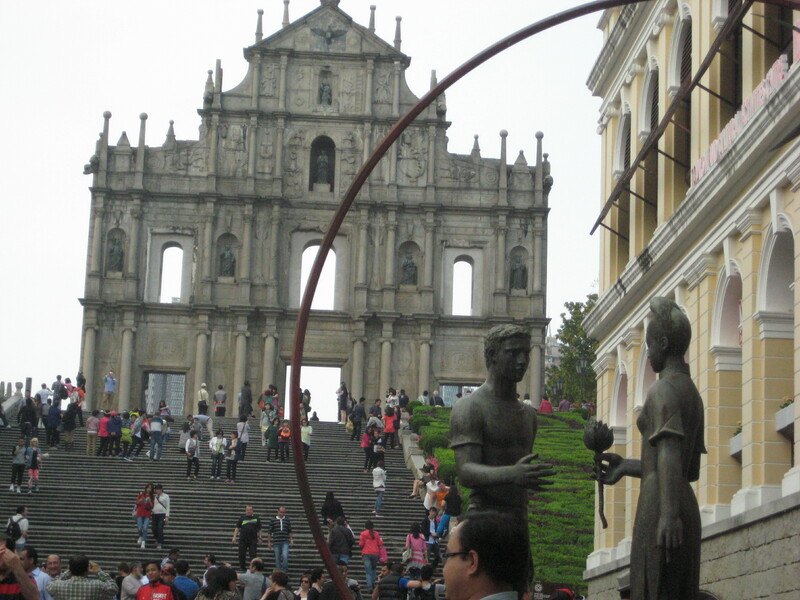 Macau consists of three islands, which were colonized by Portugal for 400 years, but reverted to Chinese rule in 1999. Macau is known as “the Monte Carlo of the Far East” for its annual Formula 3 Grand Prix race through the streets. Macau is also the gambling capital of the world with more money changing hands than in Las Vegas. Macau is similar to Hong Kong in that it is a Special Administrative Region and requires permission from the government to enter and exit. Even though we were coming from another Chinese Territory we were required to carry our passports and go through an immigration checkpoint before entering the islands. Stephen and his girlfriend, Glang, picked us up at the ferry terminal in a family member’s car, as their usual mode of transportation is a motorbike. Motorbikes are popular due to the lack of parking, congested streets and high cost of owning a car. Our first stop was for lunch at their favorite Portuguese restaurant on the most remote of the three islands. The third island is much less developed and much more green and lush with trees and plant material. The restaurant was quite large and every table was filled with locals or tourists. We had fish croquets, ribs, chicken and fries for lunch along with fresh baked bread. After lunch we stopped at a local Portuguese bakery to sample the famous tarts. The tarts, three inches in diameter with a thick flaky crust, creamy caramel custard filling served warm out of the oven were delicious. Next they took us to the Venetian Casino, which is very similar to the one we are familiar with in Las Vegas…. only larger. The gambling floor was enormous and every gaming table was surrounded by a mass of people so thick that it was difficult to see any of the tables or what type of games they were playing. The slot machines were popular as well even though it was a weekday in the afternoon. Steven said that it is much busier in the evening and on weekends. As in Vegas, there is a very large shopping center attached to the casino with a canal running through it where you can ride a gondola complete with singing gondolier. The shops were both similar and unique to us. There were many familiar brand name shops that you see the world over, but also very popular were traditional Chinese medicine shops where you could purchase a variety of herbs and teas. Glang has a favorite show at the Hard Rock Hotel and Casino that she wanted us to see so we headed across the street to see that. The show is about 15 minutes in length, takes place in an igloo like domed room where they project images on every surface around you (360 degrees). First, brightly illuminated, ornate chandeliers drop from the ceiling and then a dancing water chandelier begins dropping water from the ceiling into a hole in the floor in the center of the room. Next the fixtures retract back into the ceiling and you are surrounded by a sea of fish projected on the dome around you. Then several dragons appear who fly around the dome spitting fire and fighting with each other. It is quite a unique and interesting show with great music which we are happy to have seen. Back at the Venetian we stopped in the replica of St. Mark’s Square for a coffee before continuing on. After coffee they drove us around the old town of Macau near where Steven lives and also showed us the façade of St. Paul’s Cathedral. St. Paul’s is a 16th-century church built by Italian and Japanese Jesuit priests. Along the way we also passed the Macau Tower, the 10th-highest freestanding tower in the world. By late afternoon we were headed back to Hong Kong on the ferry so we could catch the laser light show over Hong Kong harbor at eight-o-clock. The light show was very well attended although we were not very impressed by it. They have music they play at a two level viewing area near the clock tower to accompany the laser lights, which are projected from multiple buildings roofs over the harbor. The lights were not that bright or spectacular and the music was disappointing, but we did it. Back onboard the ship we were entertained by a local variety show including two young ladies who played a couple of unique Chinese instruments. One instrument had 25 strings while the other instrument was a cross between a flute and a guitar. They were excellent musicians and we enjoyed the music. Next to perform were two girls who did the famous ribbon-twirling dance. A dozen or so young men then presented an enormous dragon dance. The dragon was on sticks over their heads, and they would manipulate the sticks to make the dragon fly through the air, twisting and turning. The dragon was painted in glow-in-the-dark paint and was presented under black lights. The final performance was by a face change artist who wears a colorful face mask which changes some twenty times during his performance but you never see him changing the mask. It is really quite remarkable how quickly he can change the mask. Upon retuning to our room we received two travel bags, another gift from the ship. With all of the shopping that some of the guests did in Hong Kong, the bags will come in handy.